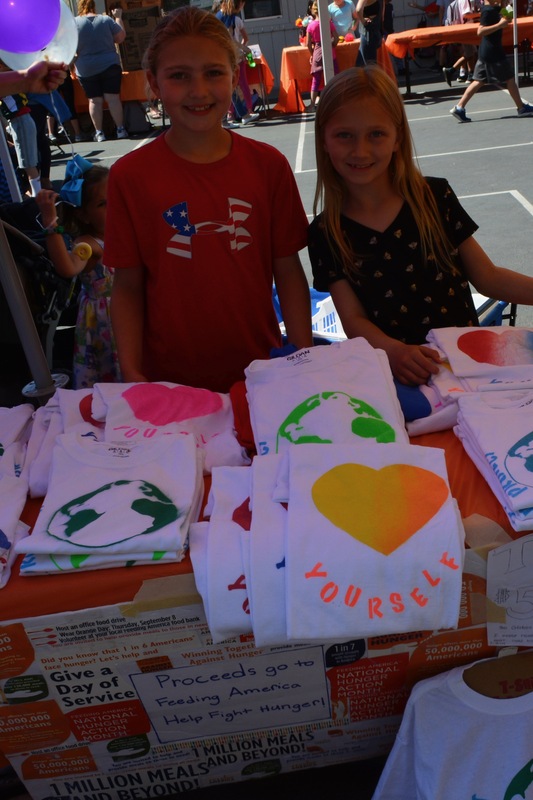 We made homemade t - shirts and bracelets to sell at the Arroyo Elementary School Ripple Fair to earn money to donate to Feeding America. Our t - shirts also have positive messages like Protect Our Earth and Love Yourself. Last year we made t - shirts with bling, it was fun and popular so we did it again with a new style, and new materials. We made the t - shirts and bracelets at home with our parents. We made signs to explain our cause. We set up a booth at the fair. We sold for 1 hour each on 2 different days. We told everyone about our cause and thanked buyers for helping to feed America. We sold 19 bracelets and 22 t - shirts, the total that we raised is $120. Two 4th grade boys bought 2 of our heart t - shirts, put them on right away and started wearing them. Another 4th grade boy bought a bracelet that most boys would not wear, for a good cause. Hunger affects more than 50,000,000 Americans and 1 in 7 people struggle with hunger in America.